For Disneyland(and I'm sure WDW also) we usually get the big, newer shipments on Thursdays so I would look this thurday! It's so weird that in the US you just wonder all the time when or if new merchandise will be released - apparently even if it's actually part of your job to know. There are some things like that at TDR, of course, but big releases are planned and well advertised/marketed/supported. I don't think I would like the Disney park experience if it was so haphazard; the seasonal, rhythmic nature of the event calendar and merchandise release schedule is one of the things that immediately hooked me at TDR. And the website's updated info about merchandise in advance of release, with pricing and firm release dates helps build anticipation and excitement. I really cannot understand why this is not done in Anaheim and Orlando??? My guess for why State side parks don't do release dates is because to many times they haven't been able to deliver for what ever reason. Guest get really upset when something is suppose to be released and it's not. Which I get. I don't tend to follow the release dates in the states anymore. My shopping money mostly goes to TDS. So I could be wrong. I do know there was a huge deal about the halloween buckets. It's as if they didnt order enough. Guest would fine out about shipments through the social media web sites. Before DLR ever said a thing. They even had problems with the Halloween buckets, Mickeys ears fell off. A Micky with one ear doesn't work so well. lol so I'm guessing the Duffy bucket may need some time to make sure it's made well. As a side note WDW tends to get items long before DLR does. Like the Dooney handbags. WDW has had a style for months now and DLR still doesn't have it. So there is unevenness between the state parks. They tend to favor WDW because it's bigger. Which is sad to me but that's life as they choose it to be. This isn't really merchandise but I thought that I would share it. I noticed that they are putting in the photo spots around Epcot World Showcase. They had a little spot in front of Japan to place your Duffy on this platform with a Duffy picture on it. So, far this is the only photo spot I noticed. But, they are supposed to have several of them in US, France, etc. Didn't have my camera with me so I will have to post pics later. I stopped at Epcot tonight and ate at The Garden Grill, then headed to the Duffy store and found the buzz outfit. Of course it is hanging in Duffy's section of my walk in closet lol! We were sent over there with the message that only we would defend Disney quality.. We learnt quickly that the Japanese culture speaks to a level of quality that is hard to comprehend. They were all unbelievably skilled and willing to do the right thing. Oo! I hope they put them in Disney California Adventure soon. So many great photo spots. 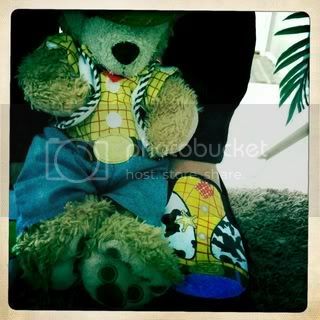 Woody is now here!!!! YEH YAH!! Is the Woody costume made as nicely as the Buzz Light Year costume? It looks like it has some good detail. I so want that Woody costume. Lucky! I didn't see them today so I'm guessing we're getting them this thursday! I can't wait! I definitely want one! Duffy is so addicting. I hope they always release new clothes, otherwise it's going to get boring, waiting for something new to dress him up in. I think buzz is a little bit nicer actually. I wish it had pockets instead of it just drawn on like the Safari outfit. I don't like that too much, but it's still pretty nice. I agree with wanting real pockets. I guess its cheaper for them to make with out the real pockets, but it sure would add a lot. Thanks for the photo of the back. I love that they do a detail of the pull string. That is cute. 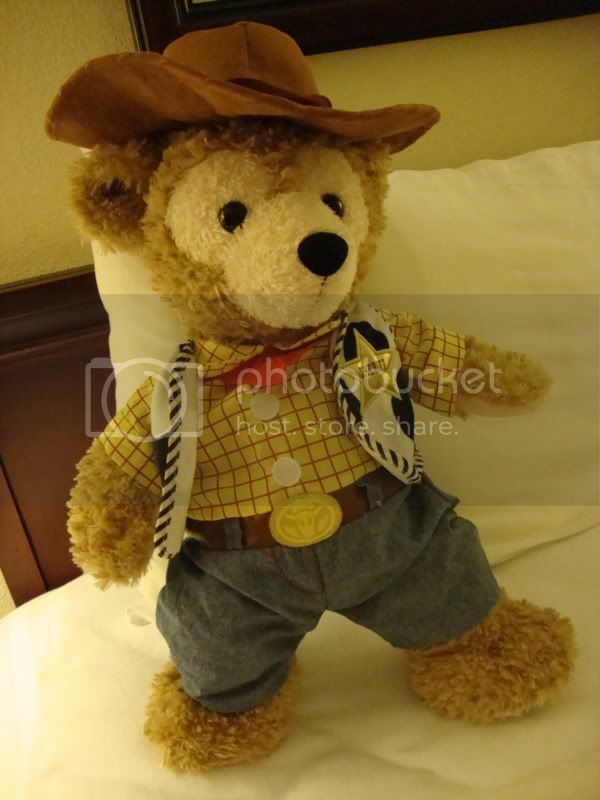 FutureImagineer183, thanks for posting that DCA doesn't have the Woody costume yet. I hope they get them by Friday. I like to see it. Just got the Woody custume at the Port orleans riverside hotel this sunday!! is so dreamy! Cute photo. They are selling Duffy clothing at Port Orleans? Wow, I am surprised to read that. I shouldn't be surprised, Disney is going to put him everywhere. At DLR, you still can only find Duffy in DCA and I like that. i really wasn't planning to buy the Buzz lightyear outfit, since i'ma major woody fan, but then when i went to the parks on saturday and saw the outfit in person i had to get it! it is really well made! like the chest part even has padding and the green is made out of some sort of vinyl or plastic and not clothes. for $15 dollars it's not bad at all! What is really strange is that it is at Port Orleans before the actual Duffy Store. That is so interesting that they had the costume at the hotel before the Duffy store. I guess people stock the stores at different times. What is also interesting is DH and I were at MK at the end of Aug 2010 and we saw Duffy. Went back a few days later and he was gone. Someone had put Duffy out and they shouldn't have. They pulled them all fast I heard. So Im wondering if CM are careful and not put things out to early.